Doubtless crammed more amusing antics into a short period of time than any other Emperor. Among them: (1) turned the Imperial palace into a cathouse, populated it with girls abducted from aristocratic families, forced randomly encountered pedestrians to patronize it, charged exorbitant rates, and killed those unable to pay, (2) decreed that no one dine with family, bathe, or laugh during the mourning period for his favorite sister, Drusilla, the penalty for any violation being death (Drusilla, like many women in antiquity, died during childbirth. The father of the child was, of course, Caligula. 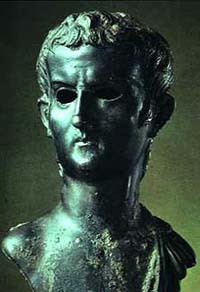 ), (3) made a gift of a large villa to his favorite racehorse, invited people to attend dinners there as a guest of the horse, killed anyone who declined to show, (4) granted godly status to the same horse, had a life-sized gold likeness made of the horse, assigned dozens of priests to serve the horse, demanded that people worship and make expensive gifts to the horse, killed anyone who refused, (5) abducted brides on their wedding day, raped them, and then returned them to their husbands -- unless they failed to please him, in which case they were killed (he always sent an explanatory note to the husbands, declaring that he'd done them a service). 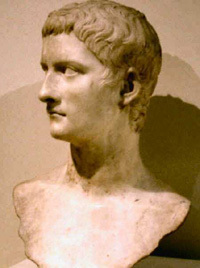 Caligula's reign was abruptly terminated by assassination: the shortsighted assassins have obviously deprived subsequent generations of many more entertaining anecdotes.